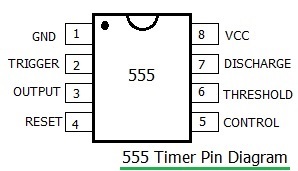 This page on 555 timer vs 556 timer mentions difference between 555 timer IC and 556 timer IC pin diagrams. Refer 555 timer basics including 555 timer IC pin diagrams and application notes in astable and monostable modes. Figure depicts pin details of the 556 timer IC. The device is dual version of 555 timer IC. It is 14 pin DIL package. The two devices inside single 556 IC may be used entirely independently. They share same electrical characteristics as the standard 555 timer IC.